I believe in embracing the truth. Living with my head in the sand and pretending that everything is normal is just not an option. See, I didn’t have what most people would call an orthodox upbringing; I’ve lived with my grandparents ever since I was very little, ever since my mother choose to give up custody of my sister and me because she couldn't provide for us. She was a teenager when she had us, younger than I am now, and she struggled with drug addiction for a very long time. And as for my father, he left my mom before I was even born and was in prison for most of my life. Heavy stuff, I know. But the thing is, however, taboo subjects like these may seem, I’ve never had a problem with explaining my situation to others. 2018 This I Believe Illinois author Katie Webb of Sullivan High School discusses that she is not ashamed of things that have happened in her life because it is the honest truth. Even as a little kid, I would openly talk about visiting my dad in prison or about how my mom lived in a different state. It just didn't bother me. Sometimes people ask me why I’m so comfortable talking about it, and my answer is always this: because it's the truth. I’m not ashamed of my background because I know that it’s not my fault and that I can’t change it. So, I’ve learned to embrace the uglier truths of my life, regardless of what other people think about it. I wish people were willing to open up about the less-than-glamorous part of their lives. So many people spend too much time and energy trying to hide their imperfections because they’re scared that if they share it, they’ll seem weird or shameful; I think this does a lot of damage to people, especially teenagers. Despite what Hallmark movies want you to believe, nobody has a perfect life. Everyone has faced some sort of struggle, has led a life with unique obstacles, and I think that if people were honest and open about this then everyone would feel less like a freak for being different. So, my philosophy is this: I will not be silent about my life simply because it seems more convenient or because I fear how people will react to it. I will embrace the parts of me that might not be perfect because I know that’s the only way I will ever grow. Because I know what I am—I’m the daughter of drug addicts, I’m a perfectionist, and I’m more naive than I ought to be. This is my truth, and I am not afraid of it. 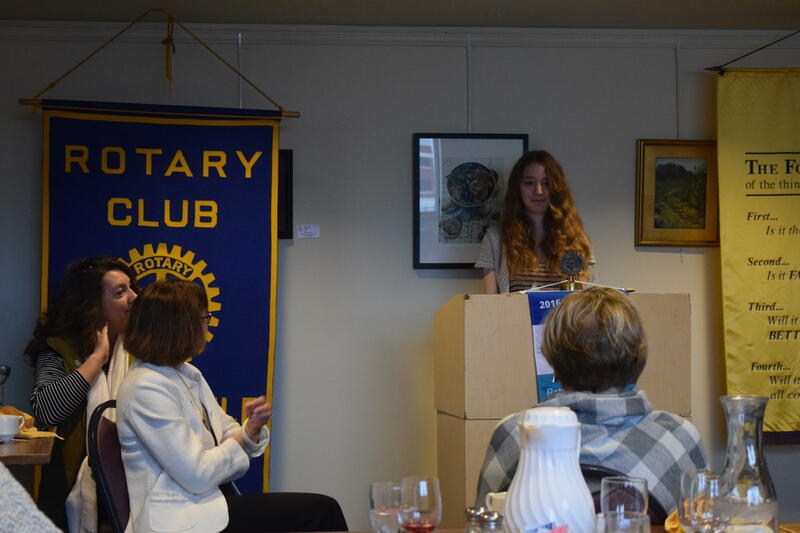 Katie Webb reads her essay at the Rotary Club of Springfield Sunrise meeting. The past is something that will always be there to push me forward. In my youth, my family struggled over many obstacles. My father was an alcoholic and got pulled over one too many times and was sent to prison. I believe in losing the shoe. I learned the value of this basic principle during a moment when a shoe seemed to be of critical importance. I am a cry baby and I am unashamed. Despite the stigma that those who cry a lot are weak or emotionally unstable, I am neither of those things. If anything, I feel all the stronger because I completely accept the fact that sometimes my eyeballs are just gonna have to look like leaky faucets.